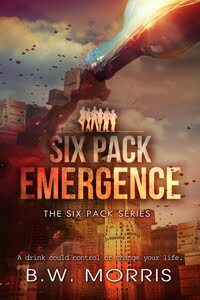 Learn more about my first book, Six Pack: Emergence. 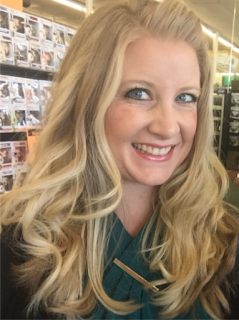 This week, I have my first Twenty Questions session with one of my fellow authors at Clean Reads: Kadee Carder. 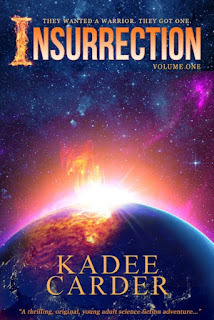 Her young adult, science fiction book Insurrection was released last October and her second book in the series will be released in February. I appreciate Kadee stopping by to talk about her book and her work as an author. I remind everyone that if you are interested in talking about your works, you can learn more about my Twenty Questions sessions here. So, everyone please say hello to Kadee Carder! 1. How did you get interested in writing? Writing has always been like a best friend to me. I’ve never been great at public speaking (although I do it quite often) but I’ve found I can write down and sort All The Things going on behind the scenes, and make sense out of life. Writing has been there, in the chaos and in the quiet, and even though we have a love/hate relationship, it’ll always come back, tap me on the shoulder, and wrap me in its arms begging for more. 2. What inspired you to come up with this story? Insurrection blossomed from a game I played with my friends in middle school. The story and characters just stuck with me. Over the years the story has shifted from a girl who ran away from an orphanage and stole a boat, to a story about a girl who had to overcome what she knew about life in order to save the world. 3. Tell me about Insurrection’s main character, Saylor, and what inspired you to create her. 4. What characters, other than Saylor, did you find enjoyable to write as you progressed with the book? I am in love with so many characters from this series. As I’ve written the trilogy, each character grew and changed in certain ways. I’ve cried with them, oohed and aahed with them, and been inspired by them. Logan has earned so much respect from me, and Micah is like the best friend anybody has ever always wanted. And Tucker, the love interest, now, he is actually on my mind and is the subject of a spin-off novella I’m currently working on. 5. What are some of the themes you explored in writing the novel? As I shaped the story arc for Insurrection, I wanted to zone in on the importance of family, and of believing in something bigger than yourself. Saylor finds she can do much greater things than she ever imagined, and I want readers to feel that as well. Saylor also has to figure out what she really wants from life. Does she want success, money, a family? And when she’s in the middle of all of that searching, everything else is suddenly stripped away and she finds herself creating a home for herself where she least expected it, and that revelation changes her life and outlook. 6. What were some of the things you learned along the way as you wrote and edited the book? 7. Do you have other published works (short stories, poetry, etc.)? I’ve written numerous articles in my university newspaper, The Yellow Jacket, and the local paper, the Brownwood Bulletin. I’ve published a poem in The Gnu, the literary magazine for National University. And I’ve maintained a blog for eight years as well. 8. What do you find is the right environment for you to write? The coziest place to write is wherever I can plug in my headphones and sip on coffee. Last spring I was able to spend two luxurious days writing in the lobby of a hotel overlooking a winding, forested river and I considered moving to the mountains because of that. There’s something about boats and sunshine. Also, there was a ton of free coffee. 9. Are there specific programs or tools you find useful to help you with the writing process? Also, youtube. There are videos for almost any subject. AND I used the street view of Google maps to walk the planet and explore places like Wyoming, Dubai, and Australia. Fun times! 10. What have you found to be useful methods for promoting your writing? Can I get back to you on that? Lol! I learn a little bit every day, honestly. I’ve found a great site called http://sassysuite.com/ where I’ve learned a lot about social media interactions. Brenda, the owner, teaches the importance of the personal connection, and I’ve begun incorporating a lot of her techniques and gained some new readers and friends because of it! 11. What are some of the famous books or authors you have enjoyed or inspired you? Madeleine L’Engle is my favorite author. Her books, “A Swiftly Tilting Planet,” and, “Walking On Water,” changed my life. I highly recommend any of her writing. She will speak directly to your heart. 12. Any aspiring or independent authors whose books you’ve read that you liked and want to mention to others to check out? Maybe he’s not indie, but he’s not well-known in my circle. Remember that little show on ABC called Castle? Well, turns out Richard Castle has several books available and they are awesome. His Derrick Storm novels are my favorites. Action, adventure, and a ruggedly handsome journalist solving crime? Can’t beat it. 13. What advice would you give to those who want to write a novel before they actually get started? How long do you have? Haha! This is a passion of mine. 1) Just write. Forget doubt, forget outcome, forget editing, forget the end result. Just sit and write, and write until you’re finished – however long that may be. 2) Start with great characters. Explore why your characters are amazing, redeemable, wretched, unforgettable, simple, complex, and extraordinary. Who was this character at 7 years old? 14? 21? 48? We will follow great characters through almost any storyline. Have a great, unique, fresh premise, but create characters we can root for through any situation. 3) In all of your writing and editing, make sure you love what you’re writing. You never know who will read it, so make sure that even if it is only you, you love it. If you’re bored, your readers are bored. If you’re confused, your readers are confused. If you’re enthralled, your readers are enthralled. If you love it and make it as good as you can, it will find whoever needs to read it to fulfill its purpose. 14. Tell me about your work as a university instructor and what it’s like working with college students. Working as an online adjunct instructor has its ups and downs! Most of my students are non-traditional students, from age sixteen to in their sixties! I absolutely love working with the military students because they usually get all their work done in time and have some of the most interesting stories to write. Because of them I have been able to soar in helicopters with night-vision goggles, tackle Marine boot camp, and tumble from airplanes in mass aerial training exercises. The online environment can be tricky, but I’ve found that older students are more committed students and they desire to learn. Helping them improve their communication skills is a huge blessing to me. My students each bring a unique story and have helped me hone my writing and editing skills. For them and Liberty University I am incredibly grateful. They open my mind, my worldview, and sharpen my abilities. 15. I see you are a coffee nerd. Where are your favorite places to get coffee? What are your favorite brews? All the coffee! We have a local placed called Common Grounds, and they have a Snickers Coffee that haunts my waking hours. On any given day I love Starbucks Breakfast Blend, Kona anything, and Illy brand coffee. 16. And you are a pizza lover, too! Where’s your favorite place to order pizza and what toppings are the best? 17. What do you love about Taylor Swift’s music? Any songs of hers you find inspiring? T Swift is just the best. She’s so classy and real, and her new albums are especially warm and inspiring. I know it’s a bit cliché, but I love Shake It Off. I mean, turn that song on and have a bad day, I dare you. Blank Space – love it. And Wildest Dreams is just so haunting and bittersweet. Perfect angsty music to listen to while writing a romantic scene. 18. Tell me more about some of the late 90’s punk rock you like (favorite bands, songs, etc.). Ah, you’ve now crossed into dangerous territory on the rambling scale! Let’s talk 90’s punk rock. How much time do you have? Angels & Airwaves, Blink 182, and Bowling For Soup are some of my favorites. Throw in a little bit of Green Day and My Chemical Romance and you got yourself a playlist. I listened to “The Adventure” by Angels & Airwaves in a near loop while writing Insurrection. 19. Do you prefer dogs or cats or is there another animal that is better than both? I have to go with cats, Bob! Dogs are too needy for me. My cat randomly goes on walks with me and I dig that. 20. Who would win a battle of superhero skills: Superman, Batman or Wonder Woman? Now. I feel like this is a loaded question. I’m all about #girlpower, so I’m inclined toward Wonder Woman. But I haven’t seen her movie yet and I don’t read comics and her outfit is not really conducive to serious hand combat. However, I’ve been a Batman fan all my life, so I suppose I’ll give a nod to the dark night for this round! Thank you so much for having me! This was so enjoyable and you asked some fantastic questions! If anyone is interested, I’ve had readers of all ages, men and women ages 14-67 who enjoyed Insurrection. Feel free to dive in to the adventure! And Volume Two will be available on February 28, 2017! Check out http://www.kadeecarder.com/ for updates and get inspiring blogs directly to your inbox!